This summary of the history of Pathfinder Village was kindly provided by long-term resident Ron Wilson who built up a remarkable history over the years and which contains a more comprehensive record of the history of the Village than can be found here. This was based on the “official history” written from old records, talks with the two Horton brothers who began the park in 1932, and from newspaper cuttings. The original site for the village was on land formally owned by the church. The father of the two brothers that started the village was the Reverend Horton. Through the village runs a stream called the “Lillybrook”. It is mentioned in records going back to the year 739 AD and also in the “Domesday Book”. It is one of the earliest charted rivers in the United Kingdom. The original Site, now known as Pathfinder Village, was established by Tony Horton in 1932 to hire out caravans for self towing. Tony was joined by his brother Gerry the following year and they then introduced the availability of caravan hire. 1934 saw the start of Pathfinder Village for holiday use only, not for permanent residence. A road, now known as Heatherfield, was hand built by one labourer using stone from the site at a cost of £400 and there was enough left over to start building the restaurant/ dining room which was later named the “Red Indian Restaurant”, and later still the “Log Cabin”. In 1936 the caravan hire fleet was increased but as business was not always constant the brothers cut and sold logs to tide them over. An old railway carriage was added to the accommodation. A rough and ready collection of sheds were built as workshops. Tony Horton volunteered for the RAF and Gerry was called up into the Army. By a remarkable coincidence both brothers were demobilised on the 10th June 1946. Tony was awarded the DFC for his exploits as a pilot. 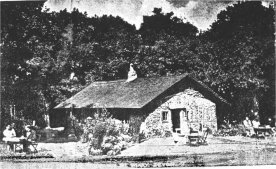 No business was possible during the war years, and The Log Cabin was let for the duration. Immediately after hostilities, a house was built behind the restaurant and occupied for some years by the two brothers and their families. At this time there were only the two brothers, a secretary and one man in the workshop to sell and hire out caravans, forge towing brackets, and make and serve meals in the restaurant. 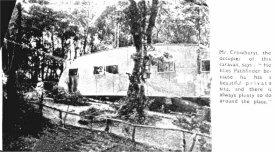 Due to a national shortage of houses, residential caravanning began. There were few regulations and customers who bought a caravan, could stay on site. No services were offered. In 1947 three more men were employed in the workshops. A little church was made available by converting the old mess building at the side of the restaurant. The building (now demolished) was still in use until 1980 when the new church was built by the Workhops and used from 1981 onwards after consecration by the Bishop of Crediton. In 1954 it was apparent that residential caravanning was here to stay so and they began planning, providing and connecting all services including central heating to the caravans. Pathfinder Village was one of the very first Parks in the country to do so. A 30-pitch touring caravan site was established at the opposite end of the bowling green and opposite to the Village Hall. The Pathfinder Caravan Company sold “up market” caravans such as Carlight and Royales. The workshops by this time had 5 star status for repairing touring caravans. Mains water was connected to replace the water being pumped around the site from 6 wells. 1956 saw the connection of mains electricity, until then a limited supply to each van was supplied by the site from three Lister Diesel generators. 1957 saw the erection of the Village Hall. Opposite the Village Hall was the bowling green – which was built over and is now part of Six Acres. In 1958 the first 32′ by 10′ caravan was built to the brothers’ own design, this was the first true Mobile Home and caused quite a stir in the trade. 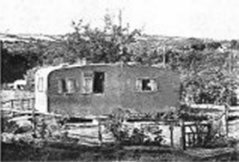 Caravans manufactured by others continued to be sited, until in 1969 manufacturing of mobile homes was started here in the Village workshops. The basic unit was 50’x 10’4″ and the largest almost double this size, 50′ X 20′. From the very start all main services were included. Central heating was standard with warm air being blown through ducts in the floor. Later the “Donair” system was used as it could also provide hot water. In 1965 Pathfinder Village came second in the National Britain in Bloom competition. Quite an achievement for what was a comparatively “young” village. In 1967/8 Pathfinder Village won the South West cup for towns and villages with a population of less than 7000. In 1989 Ordnance Survey recognised Pathfinder Village as a Village in its own right and it has been included on their maps ever since. The only Park Home Village in the UK to be so recognised. In 1987 the Horton brothers retired and sold the whole village to Avondale Property (Holdings) Limited. The Workshops were finally demolished in April 2008, and the area redeveloped in 2016 for the siting of new Long Woods mobile home development.